Ankle Sprain: A sprain results in the stretching or tearing of the ankle ligaments. A tear may be either a complete tear of the ligament or a partial tear of only some of the strands of the ligament. This tearing creates an inflammatory response that produces pain and swelling. 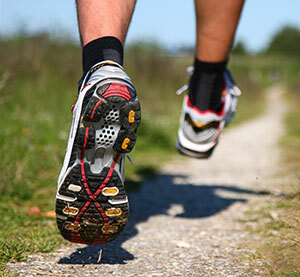 Shin Splints: This condition is most often the result of overuse. Repeated movements of the foot can damage the anterior or posterior tibialis tendons and muscles. In some cases the covering of the bone where these tendons attach may become inflamed. Anterior shin splints most commonly occur in people who take up a new activity like jogging, sprinting or playing sports that require quick starts and stops. Posterior shin splints tend to occur in people with imbalances in the leg and foot such as tight calf muscles and over pronation (flat arches). Achilles Tendonitis: The Achilles tendon is the strongest tendon in the body. It attaches the calf muscle to your heel bone. Tight and/or weak calf muscles, leg length discrepancy, or a too rapid increase in the frequency or intensity of athletic activity typically cause Achilles tendonitis. The pain is characterized by a sharp or burning pain about two inches above the heel bone of the foot. Plantar Fasciitis: The plantar fascia a dense strip of tissue that runs from the front of the heel bone to the ball of the foot. It is subjected to a tremendous amount of force daily. This force stretches the plantar fascia as the arch of the foot tries to flatten from the weight of your body. Small tears can result, which lead to pain and inflammation. As this process of injury and repair repeats itself over and over again a bone spur can form as the body’s response to try to keep the fascia attached to the heel bone. We are committed to giving 100% of our expertise and effort to every ankle injury patient at all times. This means that your dedicated physical therapist works one-on-one with you through every minute of every rehab session – providing expert assessment and guidance, and constant encouragement and support. For more information on foot and ankle care, download this brochure.